From March to October, 1.5 million bats emerge nightly from narrow crevices in the underside of the Ann W. Richards Congress Avenue Bridge. They usually start to emerge from the bridge around 20 minutes before sundown. The walkway on the east side of the Congress Avenue bridge offers the best vantage point for watching the bats emerge and fly eastward over Lady Bird Lake. The hillside below the bridge is a little more kid-friendly since you can spread out a blanket and even have a picnic while you wait. From this perspective, you’ll get a close-up view as they emerge, but then they quickly disappear over the trees that border the lake. Also, on the hillside, you do run a slight risk of being bombarded by a little bat pee or poop (aka guano). It’s rarely more than a sprinkle, but it does happen. With just a little advance planning, though, you can get an even better view from the water. You can rent kayaks and canoes by the hour from several businesses along the shoreline. Some of them even provide knowledgeable guides who share fun facts about the bats as you paddle. Tucked away on the less-crowded east end of Lady Bird Lake, Live Love Paddle hosts nightly tours to see the Congress Avenue bridge bats. Paddlers can also book a two-hour Urban Kayaking Tour, which is led by a guide who’s knowledgeable on all things Austin. The shop rents one- and two-person kayaks, canoes and NuCanoes, which are sort of a cross between kayaks and SUPs. Located about a block south of the Four Seasons Hotel at the Waller Creek Boathouse, Congress Avenue Kayaks rents kayaks and SUPS by the hour or half-day. The company offers a nightly guided bat tour during the summer. The Waller Creek Boathouse is also home to several other businesses and activities. You can rent bikes at the boathouse, take a yoga class, learn about sculling or dine at Alta’s Cafe. Located just west of Mopac on the south side of the lake, the Rowing Dock rents kayaks, canoes, paddleboats and stand-up paddleboards (SUPs) by the hour. Single, double and triple kayaks are available. The Rowing Dock hosts a Bat Paddle every Saturday during bat season. Be prepared for a bit of a workout, though. You’ll be paddling for two miles before you get to the bats, and then you have to turn around and come back. Groups of 12 or more are eligible for discounts. Adjacent to Barton Springs Pool, Zilker Park Boat Rentals offers hourly and all-day rates on kayaks, canoes and SUPs. Check the website for printable coupons and other discounts. The location near Barton Springs is convenient, but that means it can get busy during peak bat times. In addition to operating two large tour boats, Capital Cruises rents kayaks, canoes, SUPs and a giant floating swan! The Capital Cruises dock is only a short paddle away from the bats under the Congress Avenue Bridge. Located next to the Hyatt Regency, Capital Cruises also hosts several themed tours with magicians, fortune tellers and the Murder Mystery Players. Less than a mile east of the Rowing Dock on the north side of the lake, the Texas Rowing Center rents kayaks, canoes and SUPs. In addition, the Texas Rowing Center hosts the popular Latino Serenades, where kayakers paddle along with a barge full of musicians. While the bulk of the bat viewing activity occurs near the Congress Avenue bridge, you can also get a completely different perspective from points further east along Lady Bird Lake. The eastern edge of the lake is bordered by Longhorn Dam at Pleasant Valley Road. You can watch the bats from the bridge just above the dam or along the hike and bike trail closer to the lakeshore. If you rent a kayak from Live, Love, Paddle on Riverside Drive about 30 minutes before sunset and paddle eastward at a leisurely pace, you’ll soon see a black cloud of bats overhead. The most convenient parking lot is right next to the bridge near the Austin American-Statesman office at 305 South Congress Avenue. The fee is $7 for up to four hours. If you don’t mind walking, though, there is a free lot about 1/4 mile to the west next to the South 1st Street bridge. This lot is primarily used by walkers and joggers visiting the Lady Bird Lake Hike and Bike Trail and Auditorium Shores. It’s busy, but people also come and go frequently. You can park here for only two hours, but that should be plenty of time for bat viewing if you arrive just before sundown. The bats generally take about 45 minutes to fully emerge from the bridge. There are also smaller free lots along Riverside Drive. In June, the mom bats of this species of Mexican free-tailed bats (scientific name: Tadarida brasiliensis) give birth to one tiny pup. The pups feed from mammary glands located under the mother’s wings, not on the chest as in most mammal species. The pups are usually ready to fly by mid-August, which means the black cloud of bats emerging from the bridge is even more impressive during this time. In fact, the size of the colony virtually doubles because almost all of the bats that roost at the bridge are female. The males of the species don’t play any role in child rearing and usually roost in separate colonies. Why Do the Bats Roost Here? A redesign of the bridge in 1980 created crevices on the underside of the structure that were the perfect size for cozy bat homes. 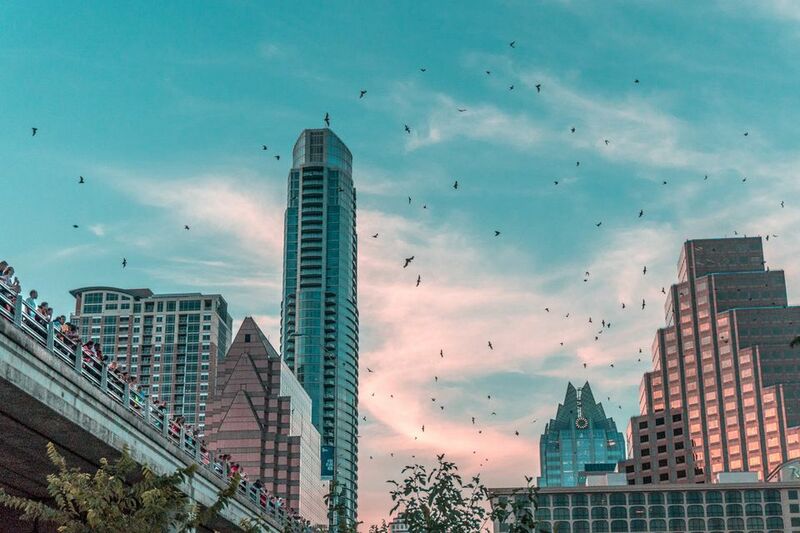 At the time, many Austin residents despised and feared the bats and tried to have the colony eradicated. Fortunately, cooler heads prevailed, and now Austinites love their bat colony. They also welcome the flying mammals’ voracious diet. The bats consume up to 20,000 pounds of bugs nightly. The newly renovated Line Hotel (formerly the Radisson) is ideally situated for bat viewing at the corner of Congress and Cesar Chavez. The hotel’s restaurants, bars and even the pool area offer prime bat-viewing opportunities. Right next door, the Four Seasons Hotel also has an excellent view of the bats from its rooms. However, the view from its ground-floor restaurant is partially obstructed by trees. Bat Conservation International provides a daily estimate of viewing times for the bats in Austin on its website. Since the bat bridge is located along the southern border of downtown Austin, the options for post-bat activities are nearly endless. The 2nd Street Shopping District, which is also packed with bars and restaurants, is within easy walking distance. Threadgill’s World Headquarters is about a block south of the bridge. In addition to serving up fine Southern comfort food, the restaurant presents live music nightly. If you’re interested in a refreshing nighttime swim, Barton Springs is less than a mile down the road. While the Congress bat bridge is home to 1.5 million bats, Bracken Cave near San Antonio has a whopping 15 million, making it the largest known bat colony in the world. The cave is on private property, and the bat viewing is managed by Bat Conservation International (BCI). This means you’ll have to do a bit more planning to view this bat spectacle. To attend a viewing, you have to become a member of BCI and sign up for one of the group’s member nights to view the bats. Once you’ve seen a black tornado of bats spiraling skyward out of the ground, you won’t regret supporting the vital work of BCI. The nonprofit organization maintains the habitat and conducts ongoing research to help the bats survive for another generation. Old Tunnel State Park in Fredericksburg has a resident population of about 3 million Mexican free-tailed bats. The bats roost in an abandoned railroad tunnel and emerge nightly from May through October. Admission to the park is free, but there is a $5 charge (cash only) for access to the bat viewing area.